This data set provides mean leaf area index (LAI), dendrometry band measurements, and litterfall mass from samples collected at the km 67 research site, Tapajos National Forest, Para, Brazil. Litterfall collections were from January 23, 2004 through December 3, 2004, dendrometer measurements were monthly between December 2003 and December 2004, and LAI measurements were collected from January 26, 2004 through November 3, 2004. 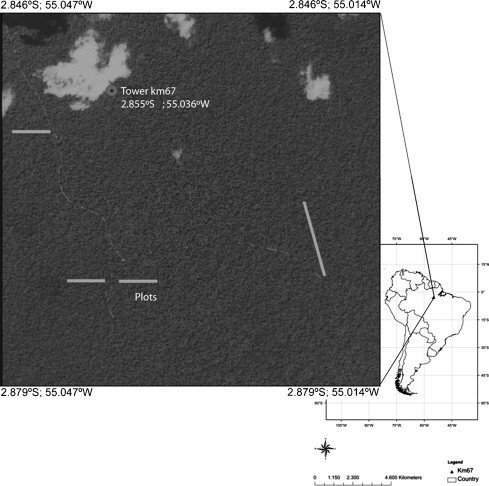 All measurements were taken at the km 67 site in the Tapajos National Forest. This site is situated in an area of Amazonian primary tropical forest belonging to the municipality of Belterra, Para, Brazil. The forest is mostly evergreen with a few deciduous species. The canopy is characterized by large emergent trees up to 55-m tall, with a closed canopy at approximately 40-m; there are few indications of recent anthropogenic disturbance other than hunting trails. Measurement plots (50) were established along 4 transects at the site and within each plot, 5 subplots were established. The longest transect (25 m x 500 m) was the location of 20 (25 m x 25 m) plots. The other 3 transects (25 m x 250 m) contain 10 plots per transect. Note that the assignment of plots to transects is not provided. There are four comma-delimited data files (.csv) with this data set. Fig. 1. Location of the study area (plots) in Tapajo´ s National Forest, Belterra, State of Para, Brazil. This is an Ikonos image showing the layout of 4 transects. The longest transect (25 m x 500 m) shows the location of 20 (25 m x 25 m) plots. The other 3 transects (25 m x 250 m) contain 10 plots per transect. Each plot has 5 subplots (not shown). From Malhado et al., 2009. The investigators were Cohen, Warren B.; Costa, Marcos Heil; Ahl, Douglas Eric; Andrade, Ricardo Guimaraes; Budney, John Walter; Castleton, Dulce; Figueiredo, Daniel Nunes; Gower, Stith Tom; Kennedy, Robert E.; Maiersperger, Thomas Krueger; Portilho, Kleber da Costa; Ritts, Dave; Senna, Monica Carneiro Alves; Filho, Jose Danilo Souza and Turner, David P. You may contact Cohen, Warren B. (warren.cohen@orst.edu) and Costa, Marcos Heil (mhcosta@ufv.br). This data set provides mean leaf area index (LAI), dendrometry band measurements, and litterfall mass from samples collected at the km 67 research site, Topajos National Forest, Para, Brazil. Litterfall collections were from January 23, 2004 through December 3, 2004, dendrometer measurements were monthly between December 2003 and December 2004, and LAI measurements were collected from January 26, 2004 through November 3, 2004. File 1. CD15_Litterfall_2004.csv. Measurements were made from January 23, 2004 through December 3, 2004. File 2. CD15_LAI_2004.csv. Measurements were made from January 26, 2004 through November 3, 2004. File #3: CD15_Dendrometer_measurements_2003_2004.csv. Measurements were made from December 2003 through November 2004. This file contains the dates the dendrometry measurements reported in file 3, CD15_Dendrometer_measurements_2003_2004.csv, were taken in each plot, for measurements one through 11, and the final measurement date (YYYYMMDD). The data set covers the period 2003/12/10 to 2004/12/03. Temporal Resolution: Dendrometers were recorded monthly between December 2003 and November 2004. These data were collected as part of the Bigfoot Project which used field data and eddy flux meaurements to validate remote sensing estimates of gross and net primary productivity across a number of biomes. Concerns about dendrometer data are noted in the data file (e.g. band ruptured or replaced). The tree species and size classes determined during a 2001 reconnaissance trip are unavailable. Abundant tree species include the tauari (Couratari guianensis),matamata (Eschweilera sp. ), massaranduba (Manilkara huberi), andiroba (Carapa guianensis), tachi (Sclerolobium paniculatum), abiu (Pouteria sp. ), breu (Protium decandro), and louro (Licaria guianensis). Soils are nutrient-poor clay oxisols with low organic content. The monthly incident photosynthetically active radiation (PAR) values vary from 640 to 850 mmol per m2 per s (Senna et al., 2005). The annual mean precipitation is 1911 mm, the mean temperature is 25 degrees C, and the dry season extends from July to November (Juarez et al., 2009). 50 plots were established along 4 transects at the site and within each plot, 5 subplots were established. The longest transect (25 m x 500 m) was the location of 20 (25 m x 25 m) plots. The other 3 transects (25 m x 250 m) contain 10 plots per transect. Note that the assignment of plots to transects is not provided. See Figure 1. Litterfall was collected in 250 litter baskets (0.25 m2 surface area each) installed in each subplot and collected every month. The leaves were separated, dried in an oven for 24 h, and then weighed. Branches, fruits and seeds were discarded. The exact date of each collection is recorded in the data file. Samples were collected from January 23, 2004 through December 3, 2004. LAI measurements were made monthly from samples in the 25 x 25-m plots using three LAI-2000 Plant Canopy Analysers (Li-Cor, 1992). This technique is referred to as the indirect non-contact method and represents the projected area of leaves taking into account individual leaf inclinations (Scurlock et al., 2001). One of the instruments was installed on the top of a tower to measure the diffuse radiation on the top of the canopy, while the other two measured diffuse radiation at about 1-m high. The Plant Canopy Analyser measures diffuse radiation with a light sensor, in the 320 to 490 nm range where the radiation scattering by leaves is minimal. LI-COR software was used to determine the canopy transmittance and the LAI (m2 leaf area per m2 ground area) per subplot using an instrument specific formulation. The fraction of photosynthetically active radiation (fPAR) was estimated from the DIFN variable provided by the Li-Cor LAI-2000 Plant Canopy Analyzer (Gower et al., 1999). LAI data are included from January 26 through November 3, 2004. Dendrometer measurments were made in 25 x 25-m plots and subplots. Woody biomass increment was determined from radial growth, measured using rust-resistant dendrometer bands (Walker and Whiteaker, 1988) to measure annual diameter growth. Dendrometer measurements were read monthly between December 2003 and November 2004. Actual dates for each reading are included in file 4, CD15_dendrometry_dates.csv. Gower, S.T., Kucharik, C.J., and J.M. Norman. 1999. Direct and indirect estimation of leaf area index, fAPAR and net primary production of terrestrial ecosystems. Remote Sensing of Environment 70:29-51. Juarez, R.I.N., Rocha, H.R., Figueira, A.M.S., Goulden, M.L., Miller, S.D., 2009. An improved estimate of leaf area index based on the histogram analysis of hemispherical photographs. Agricultural and Forest Meteorology 149, 920-928. Scurlock, J.M.O., Asner, G.P., Gower, S.T. 2001. Global Leaf Area Index Data from Field Measurements, 1932-2000. Available online [http://daac.ornl.gov/] from the ORNL Distributed Active Archive Center, Oak Ridge National Laboratory, Oak Ridge, Tennessee, U.S.A.
Senna, M.C.A., Costa, M.H., Shimabukuro, Y.E., 2005. Fraction of photosynthetically active radiation absorbed by Amazon tropical forest: a comparison of field measurements, modeling, and remote sensing. Journal of Geophysical Research 110, G01008. Walker, L. R., and L. D. Whiteaker. 1988. Rust prevention on dendrometer bands. Biotropica 20:336-337.